I’ve decided to step it up a notch and DREAM REALLY BIG. If I could eliminate ADHD, I certainly would. However, this post is more about taking a different look at the ficticious epidemic of ADHD. This is Part II on my Reform Schools Dream. Again, I am just hoping to inspire more people to educate themselves about the outdated model our schools are built upon and to demand better for our children. At the bottom is one of the first videos that got me fired up. I hope it will do the same for you. “This is the modern epidemic, and it’s as misplaced and it’s as fictitious. This is the plague of ADHD. 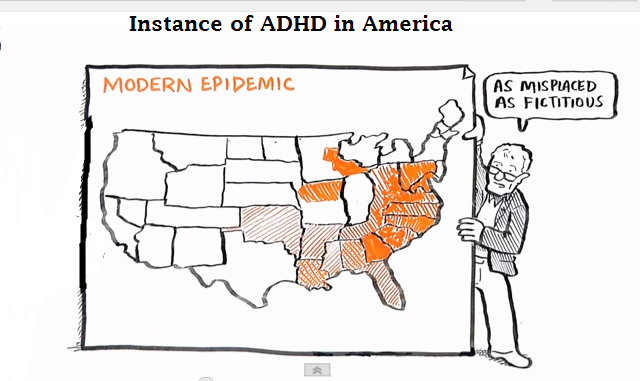 Now this is a map of the instance of ADHD in America, or prescriptions for ADHD. Don’t mistake me I don’t mean to say there is no such thing as attention deficit disorder. I’m not qualified to say if there isn’t such a thing. I know that a great majority of psychologists and pediatricians think there’s such a thing, but it’s still a matter of debate. What I do know for a fact is it’s not an epidemic. These kids are being medicated as routinely as we have our tonsils taken out, and on the same whimsical basis and for the same reason: medical fashion. Our children are living in the most intensely stimulating period in the history of the earth. They are being besieged with information and parse their attention from every platform; computers; from iPhones; from advertising holdings; from hundreds of television channels; and we are penalizing them for getting distracted. From what? Boring stuff. He goes on to explain Divergent Thinking which is the ability to see lots of possible answers to a question and lots of possible ways of interpreting a question. When tested in Kindergarten, 98% of kids scored at the genius level and when those same kids were tested 5 years later, their scores went down. Then again 5 years later, they were even lower. These kids became educated and now there is only one right answer and that’s going to be on the test. Does that sound engaging and exciting to you? I don’t think so. We have to correct this pattern in our education because our kids are not getting prepared for the level of problem solving and collaboration that our modern world and future challenges will demand. I could go on and on…and likely will, in a future post. I would love to get some feedback to this post. Please share your comments. Enjoy the 11 minute video.